St. Louis Metro SPECIAL OFFERS & PACKAGE DEALS!! Start that needed SPRING CLEANING!! 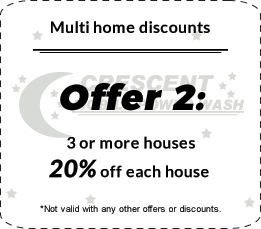 Crescent Mobile Power Wash is pleased to present our current special offer. For your convenience, you can print this offer by clicking on the link below. 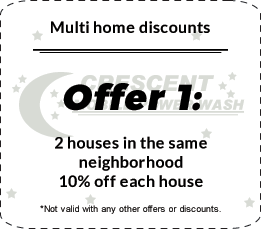 Mention your savings coupon to your Crescent Power Washing Professional to save big! Be sure to check back often to see upcoming specials and package deals. THE POWER OF CLEAN! CALL US TODAY! "We wanted to get our house pressure washed before painting it. Crescent Mobile Power Wash showed up and did our home, the driveway, walkway, patio, and carport for a decent price. Great Job, we will be passing along your name!" "What a difference! The house looks great, just like new!" "The driveway and sidewalks looks amazing! I can’t believe they were that nasty! And now my gutters will actually work!" "Thank you for doing such an amazing cleaning service on my roof! I was blown away by how clean and updated my house looks now that the roof is clean! With little children, I was pleased that Crescent Power Wash had a GREEN process and won’t harm us or the plants. We really thought we might need a new roof, but with the cleaning you did, we can postpone getting a new roof…hopefully for many years!" "We would like to take this opportunity to thank you for performing such a thorough job refinishing our deck. We are very pleased with the final outcome and would not hesitate to hire you for another refinishing job or recommend your service to a prospective customer." Locally owned and operated, Crescent Mobile Power Wash, Inc. has been servicing the St. Louis area since 1999. We are a full-service pressure washing company providing services ranging from residential to commercial to environmental-conscious cleanings. Crescent is dedicated to superior quality service with affordable prices, operating year round, seven days a week. 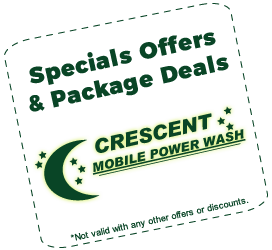 © Crescent Mobile Power Wash, Inc. All Rights Reserved. Licensed and Insured.